This week we continue looking at the oldest and biggest tress in the world, but instead of looking up we’re going underground to have a look at a root system. A clonal root system, to be exact. You’ve seen Old Tjikko, the oldest living clonal tree in the world, but old Mr. T is not the oldest living clonal system in the world. That honour belongs to Pando The Trembling Giant, a colony of Quaking Aspen trees in Fishlake National Park in Utah. Pando is an ancient clonal root system and although the individual trees live for about 130 years the root organism itself is estimated to be 80,000 years old. Pando was alive when early humans were first migrating out of Africa and it would be about 65,000 years before human eyes even reached the Americas to see Pando. Pando is more than a group of trees that have withstood the test of time. Pando is actually just one tree; all the aspens of Fishlake National Forest are part of the same organism… Genetic testing has helped confirm that each tree in the forest is the same organism reproduced over and over again with only slight genetic variations. Instead of spreading seeds, the clonal grove extends its roots in a process called “suckering.” New “trees” shoot up alongside the old ones, looking like new seedlings — but they actually belong to Pando’s extensive root system, which is why the different trees present nearly identical appearances. They’re essentially clones of the existing foliage. 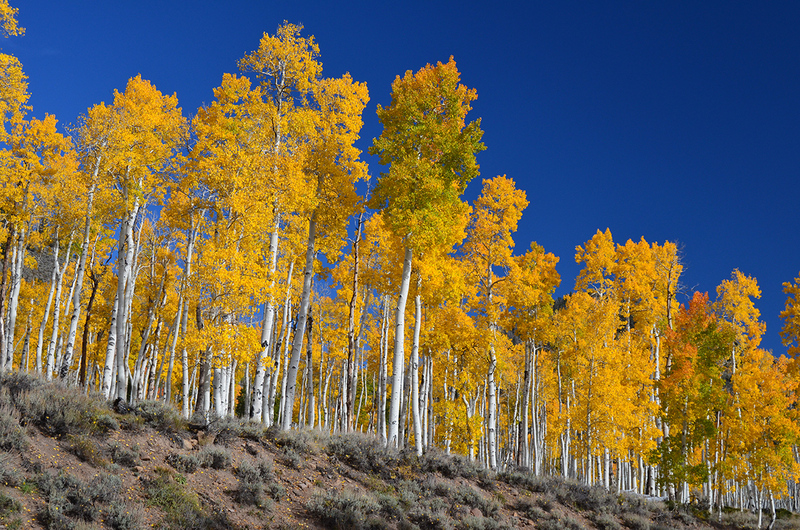 Scientists believe that every tree in the Pando colony shares the same root system. The result is one of the largest and oldest living organisms on earth and a remarkably resilient forest. Pando’s deep, connected roots have allowed it to survive millennia of fires, droughts, climate shifts, and diseases. Pando is big, too. It covers 107 acres and weighs in at an estimated 6,615 tons which makes it the worlds heaviest living organism. By comparison, a blue Whale is a lightweight at only about 200 tons. Pando is currently threatened by over-grazing of deer and elk, but a conservation project has been implemented and fences seem to be successfully working. So there you have it. I think we can safely say that Pando is definitely the oldest and the biggest tree in the world. Check out the full article and a few more photos at All That’s Interesting. That photo is simply amazing. Go Pando go! This is almost more aspen than the mind can comfortably conceive. Our aspens have a green trunk, which will help them to start their growth in spring, before the leaves, the trembling leaves burst out.